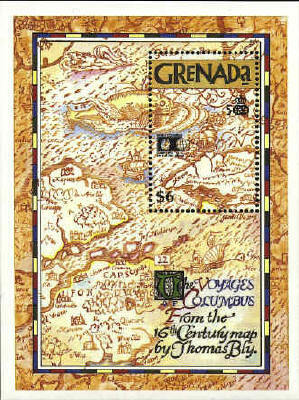 The stamp from the Graneda displays a portion of a 16th century map by Thomas Bly. The stamps from New Zealand show Columbus' ships, the Santa Maria, the Nina and Pinta against a background map of Europe and the Atlantic Ocean. The Nina is shown from the rear on the second stamp.